"The Best Ice Cream Stand in Upstate NY"
Churning ice-cream is a Hoover family tradition. Starting when he was knee-high, Daniel learned the trade from his father.Now, teamed up with his wife Elizabeth, a long-term ice-cream addict, the Hoover family has taken ice-cream gourmet. First of all, ice-cream wasn't good enough, frozen custard was their bit. They both grew up on organic farms, so local and organic ingredients were a must. Along the same thought, nasty things like corn syrup and artificial flavors and colors were permanently banned. Then came the pivotal moment in history. The egg. They started with chicken, but decided to try duck and it blew everyone's minds and tastebuds! They started their own flock and never looked back. Now their Ancona ducks are the stars of the show and are responsible for the best tasting, local frozen custard that can be found. Spotted Duck. It's all about the Ducks! Who wants to clean off the dasher? Wild picked black raspberries. What more can we say? Calling all tough guys or gals. Here is a flavor that will leave you blowing smoke. Dark chocolate custard with chunks of dark chocolate and jalapeño flakes. Sweet, dark and spicy. Prepare to get chunky. With a base of creamy caramel and enough almond slivers and dark chocolate pieces to bruise your mouth, you're in for a ride. A lovely dairy free custard made with coconut milk, coconut brittle and coconut flakes that leaves you thinking..."I can't believe it's not Dairy!" If you’ve ever felt a little naughty before noon, this is the flavor for you. Featuring Rochester’s own Black Button Distilling Bourbon Cream, maple sugar and bacon. Local- Most of our ingredients are sourced right in our neighborhood. With some products coming from the region and some from the backyard, we are supporting local economies and kicking our carbon footprint to the curb. Organic- Over 95% of our ingredients are either certified organic or grown following the same guidelines. 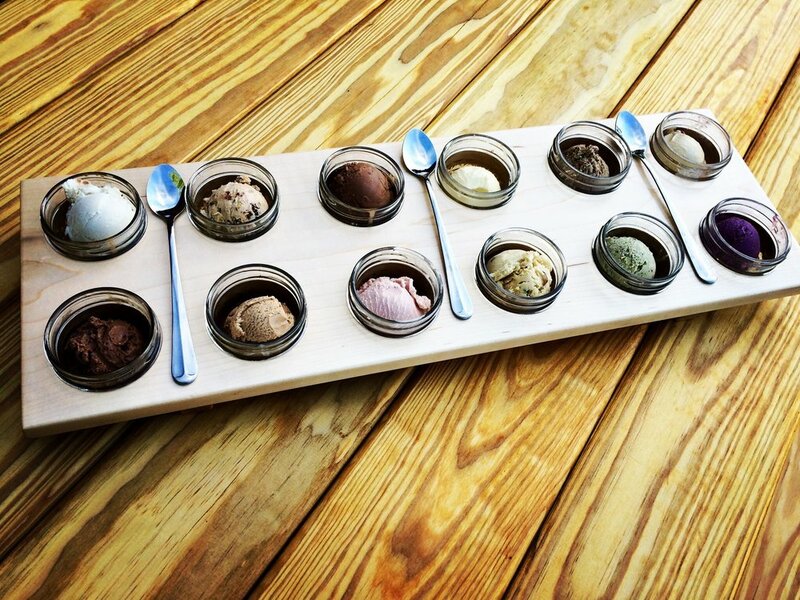 What this means for you is the healthiest ice-cream you can find that actually tastes good! On Farm- We are proud to grow and raise a good amount of our ingredients right here at the Creamery. 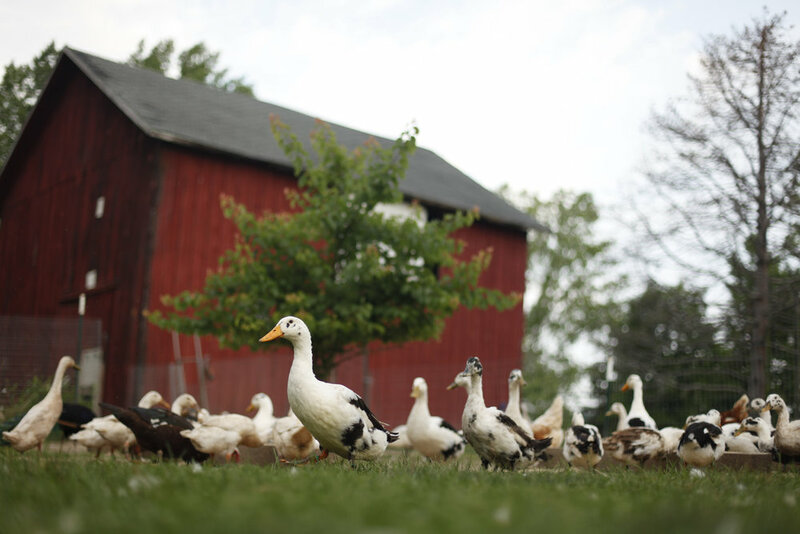 Our lovely Ancona ducks supply us with delicious, rich eggs that make the creamiest custard, and our gardens provide us with delectable fruits that go from field to churn faster than you can say "ooh la la!" Said fruits include blackberries, strawberries, blueberries, black raspberries, apples, pears and cherries. Real- What do we mean by real? Real, as in, unadulterated honest-to-goodness ingredients. Ingredients like milk, sugar, eggs, cream, fruit and house-made vanilla. You won't find any artificial colors, flavors, preservatives here. Corn syrup is banned from the property and hydrogenated oils are nowhere to be found. You can lick and slurp easy knowing that your sacred right to partake of "real" ice-cream has been protected. This picture is of our lovely ladies that provide the eggs that we use to make our delicious, one of a kind custard. Hence the name... Spotted Duck! Ducks make a far superior custard than chicken eggs. The increased yolk size makes a much richer flavor while the firmer whites are a better suspender, giving our frozen custard it's signature creamy texture. The Ancona is a hardy, adaptable, all-purpose duck. It is an excellent layer, typically laying 210-280 white, cream, or blue eggs yearly. This wonderful duck also grows relatively quickly, and produces high quality meat that is more flavorful and less fatty than that of most Pekin ducks. Anconas are well suited for situations where they can forage for some of their food and are capable of eating large "banana" slugs. "They make excellent pond or yard ducks since they tend to stay close to home, do not fly under normal conditions and are large enough so that they are less likely to be preyed upon by winged predators. Typically they have moderately calm temperaments and make fine pets." Pizza Posto will be serving up their fresh, delicious, wood fired pizzas on these dates from 5:30-8:00pm. 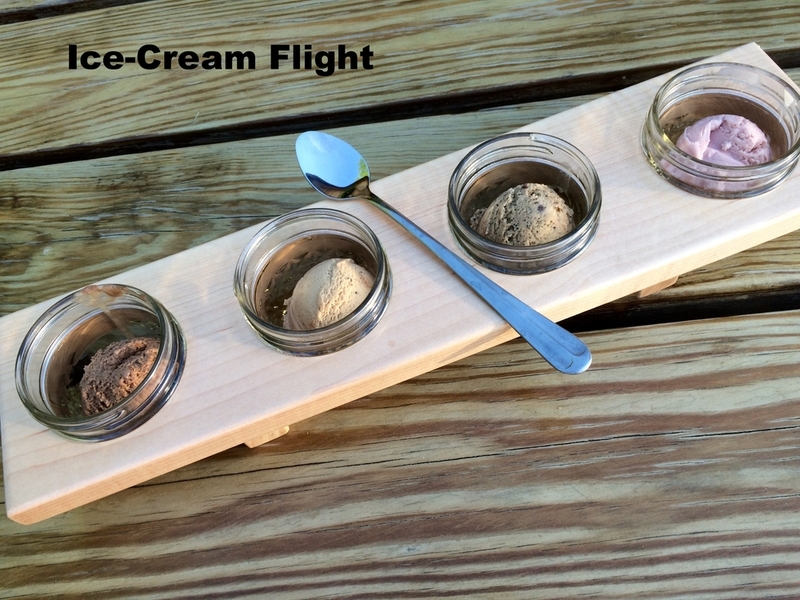 If you would like to try our fantastic frozen custard or if you are an established addict and would like to know where to get your fix, you can come right to the farm.